This was in October 2013, a view from the new hide at Loch Gruinart. 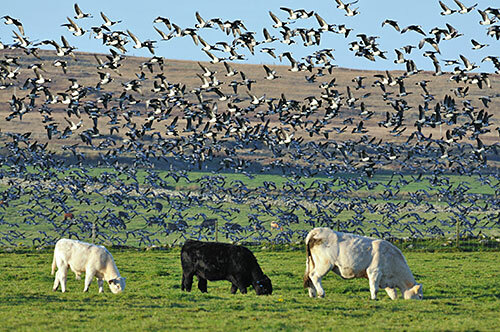 A huge number of Barnacle Geese (the picture only shows a fraction of them) lifting off having been spooked by something, cattle grazing below them, unperturbed. That's all I've got for tonight. I hope you like the picture, may be while listening to some nice music and enjoying a wee dram of Islay single malt? Have a great weekend!